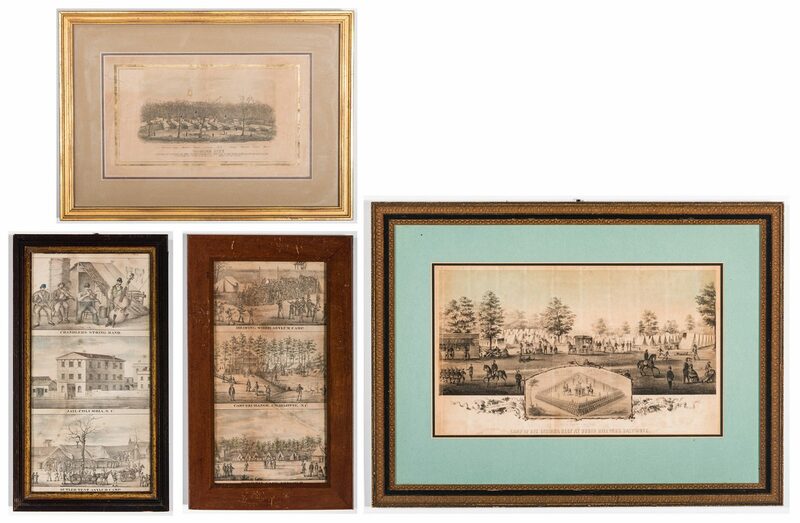 Group of four (4) assorted Civil War prints. 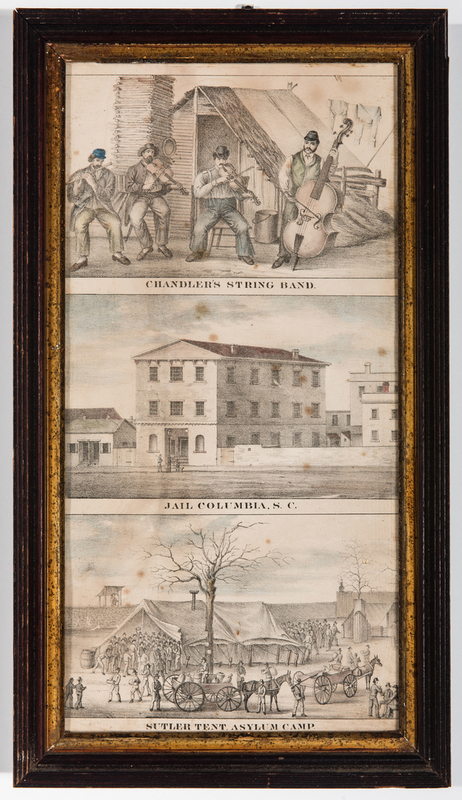 1st-2nd items: Two (2) lithographs cut from "The Southern Prisons of the U.S. Officers", lithographed and printed by E. Sachse and Company, sketched and published by Robert J. Fisher, circa 1865. 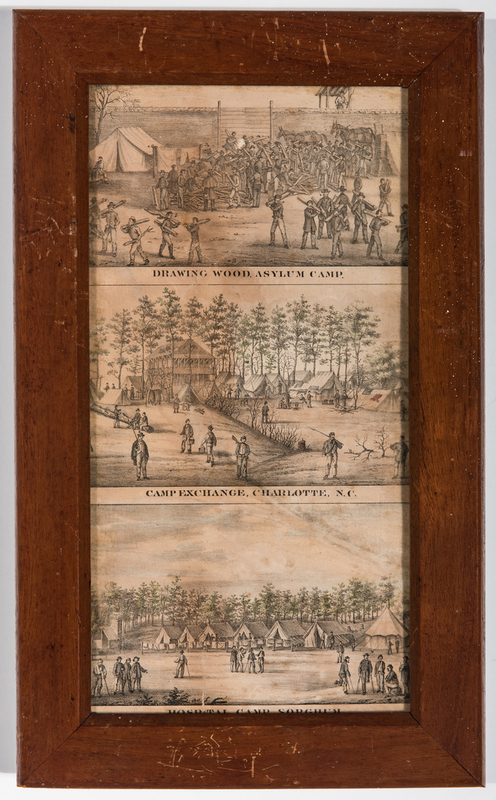 Scenes depicted include "Drawing Wood, Asylum Camp", "Camp Exchange, Charlotte, N.C.", and "Hospital Camp, Sorghum" in one frame, and "Chandler's String Band", "Jail Columbia, S.C.", and Sutler Tent, Asylum Camp" in the other frame. Both housed under glass in wooden frames, one painted black with gilt wood rabbet edge. 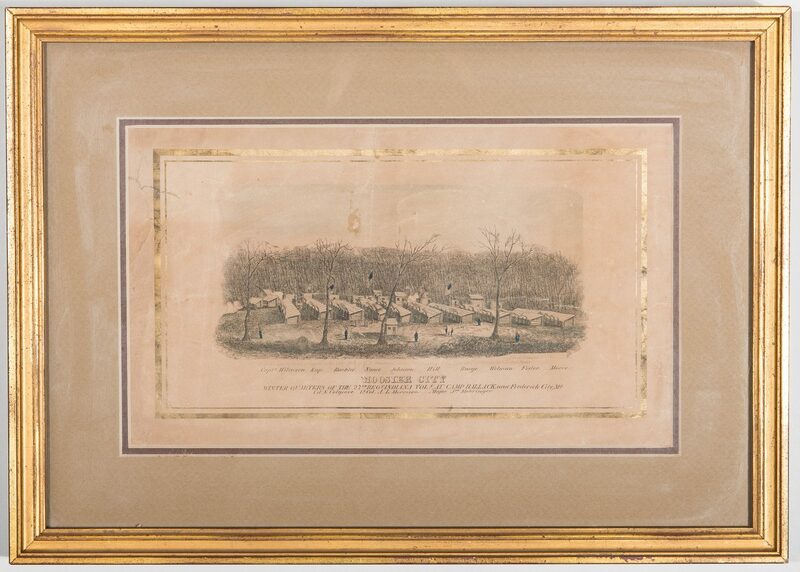 Sight ranges from 13 1/2" H x 7" W to 14 1/2" H x 7 1/4" W. Frames range from 16 3/4" H x 9 1/2" W to 17" H x 10 3/8" W. 3rd item: Lithograph titled "Camp of 21st Indiana Rect. 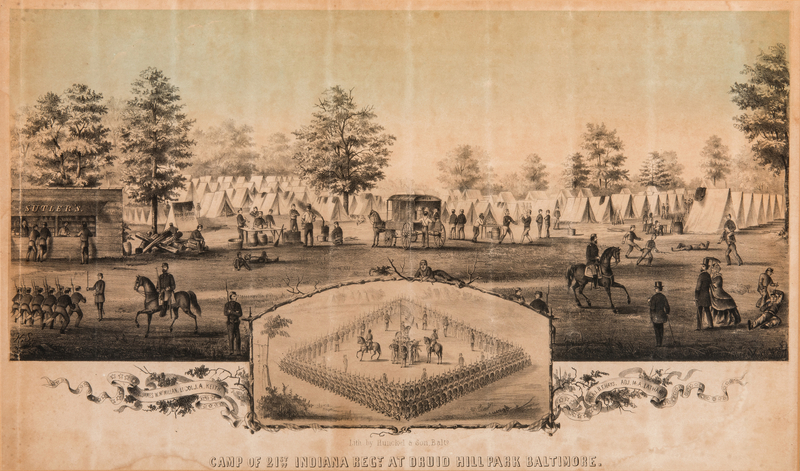 at Druid Druid Hill Park Baltimore", lithographed and published by Hunckel & Son, Baltimore, circa 1861. Turner Art Gallery, Denver, CO, label en verso. Signed "H.S." in the stone, lower left of image. Matted and housed under glass in a black painted frame with gilt lamb's tongue running pattern and bead course rabbet edge. Sight – 10 1/2" H x 17 3/4" W. Framed – 18 3/4" H x 25 3/8" W. 4th item: Lithograph with hand-coloring titled "Moosier [sic] City Winter Quarters of the 27th Regt. Indiana Vols. 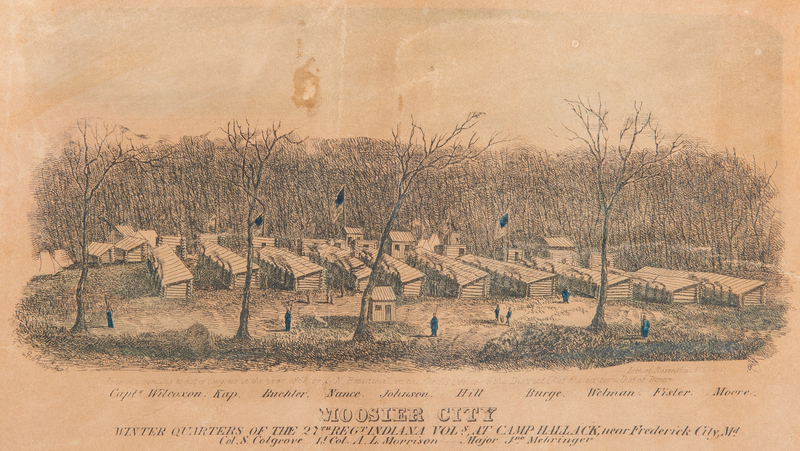 at Camp Hallack, near Frederick City, Md. 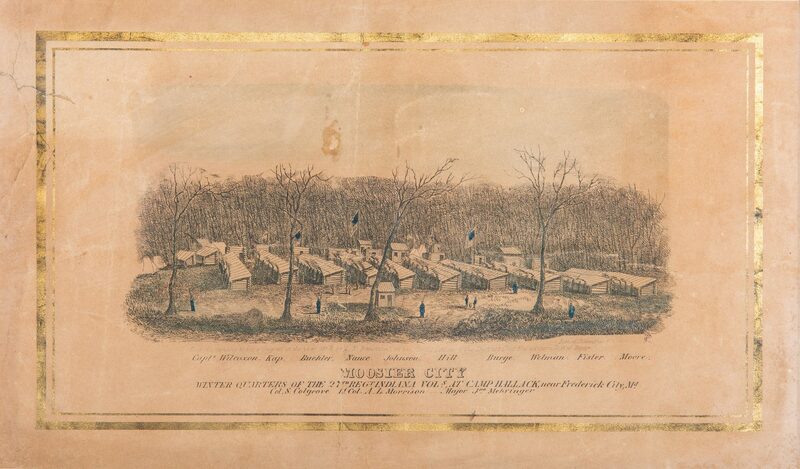 ", lithographed and published by Louis N. Rosenthal, Philadelphia, circa 1862. Turner Framing, Inc., Great Falls, Fall Church, VA, label en verso. 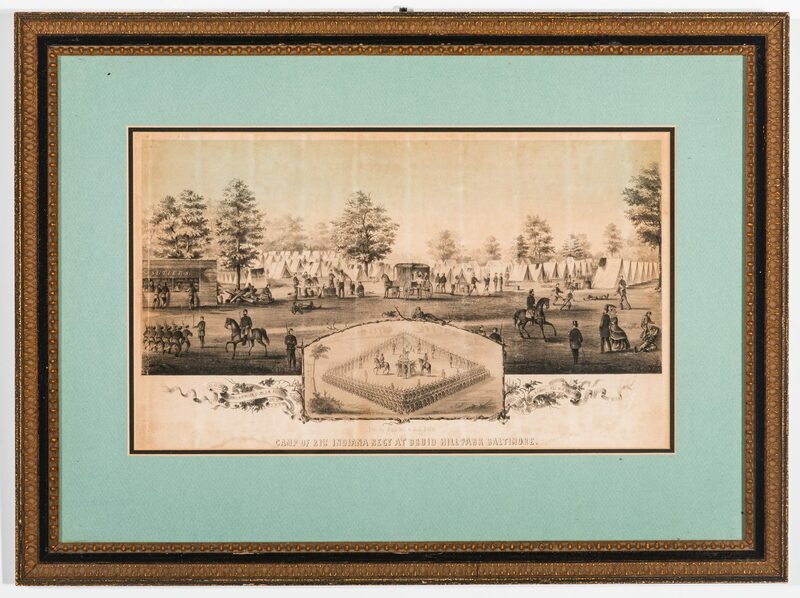 Matted and housed under glass in a gilt wood frame. Sight – 7" H x 11 3/4" W. Framed – 12" H x 16 3/4" W. Provenance: The collection of internationally known ragtime pianist and music historian Johnny Maddox, Gallatin, TN. CONDITION: 1st-2nd items: Overall good condition with foxing spots, largest 1/2", toning/acid damage to be expected from age. 6" tear across "Camp Exchange" image and lower left of "Drawing Wood" image. Few areas of hand-coloring to images in frame with "Chandler's String Band". Not examined outside of frames. 3rd item: Overall good condition with foxing spots. areas of dampstaining, toning/acid burns, to be expected from age. Two tears, largest 3/4", lower left and right outside of image. Not examined outside of frame. 4th item: Overall good condition with foxing spots, areas of toning/acid burns, fold lines, to be expected from age. 5/8" stain, top center of image. 1 1/4" x 2 1/4" tear, top left outside of image. Title is misspelled.